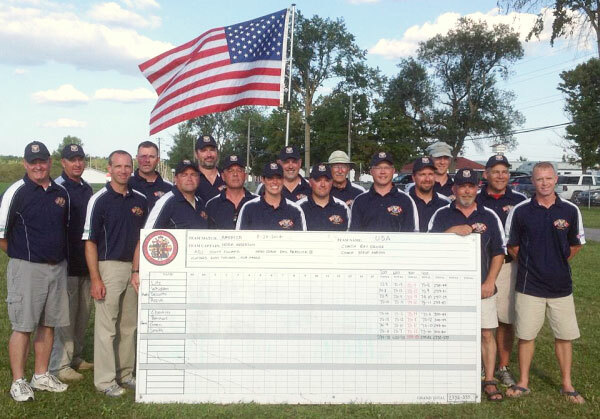 Congrats to Team USA, winners of the 2014 Target Rifle America Match in Ottawa, Canada. This year the American Team shot superbly to win this prestigious sling-shooting competition, finishing with a record score: 2392-339V. The America Match is an international fullbore rifle team Match held this year at the Connaught Ranges near Ottawa, Ontario, Canada. The America Match was held on August 24 as the culmination of the Dominion of Canada Rifle Association (DCRA) Fullbore Rifle Championships. The Fullbore championships were being held this past week, with the Grand Aggregate commencing on Sunday, 17 August and the Final of H.E. The Governor General’s Prize on Saturday, 23 August. Team Size: Captain, Adjutant, Main Coach, 2 Target Coaches, 8 firers and 2 Reserves (total team strength 15), from a single country or group of countries approved by the DCRA. One team per country/group may enter. Course of Fire: There were sighting shots (convertible) and 15 shotson score at 300 and 600 yards, and at 800 and 900 meters. Share the post "Yanks Win America Match with Record-Setting Performance"
Over the years, while working with various AR-15 cartridges that require a larger bolt-face bolt (i.e. bigger than a 5.56 NATO/.223 Rem bolt-face, like those cartridges that use a 6.8 SPC bolt or the bolt face suitable for the 6.5 Grendel-based cartridges), I have found that there is an increased potential for a certain type of jam if a modification to the standard “Mil-Spec”, square-edged ejector is not made. The original AR-15 square-edged ejector design was made for a much smaller-diameter bolt face and the smaller diameter 5.56 NATO/.223 Rem case, and it works perfectly in that application. However, as people have adapted the AR-15 platform to shoot bigger cartridges, some parts have been modified to accept the larger cartridges (i.e. bigger bolt-face bolts for the 6.8 SPC and the 6.5 Grendel, and different extractors), yet other parts have been all but ignored. One of these “ignored” parts has been the ejector. Most of the larger-bolt-face AR-15 bolts still use the standard “Mil-Spec”, square-edged 5.56 NATO/.223 Rem. ejector. That’s the problem. But there is a simple, reliable fix! 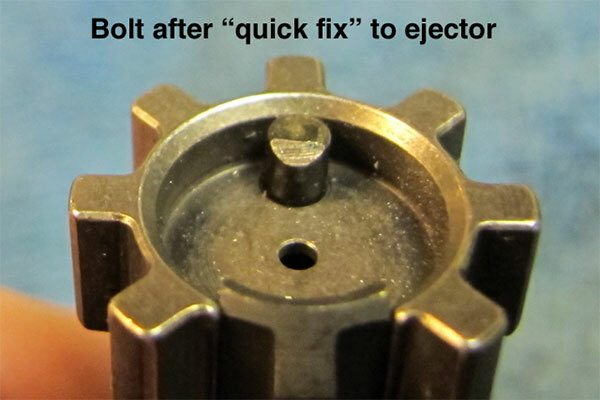 With the larger bolt face and the larger-diameter AR cases, the old-style “Mil-Spec” ejector can cause infrequent but still annoying jams if the ejector is not modified. 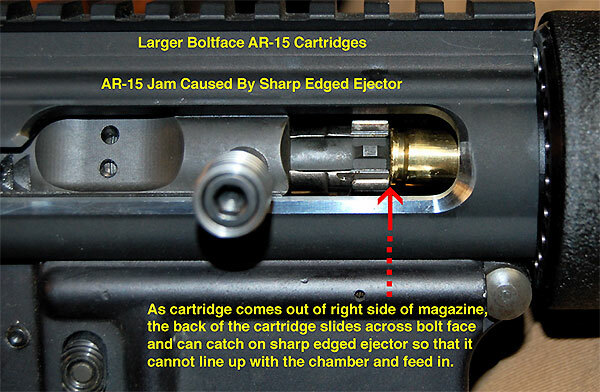 The jam can occur when a cartridge case feeds up and out of the right side of the magazine, and as it does so, the back of the case must slide across the bolt face and sideways over top of the ejector if it is to center up to the chamber and feed in. If the side of the case catches on the sharp-edged ejector you can get a jam. (See picture above). Fortunately there is an easy fix for this. One way is to take the ejector out and spin it in a lathe or cordless drill and machine or grind it and round or chamfer the sharp edge. (See picture of rounded ejector next to square edged ejector). 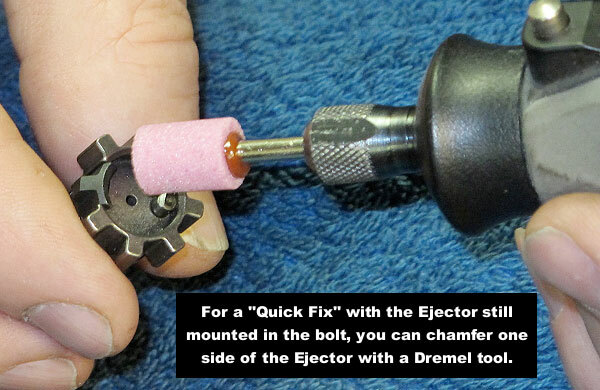 Another “quick fix” is to leave the ejector in the bolt and chamfer the sharp edge with something like a Dremel tool. (See picture). 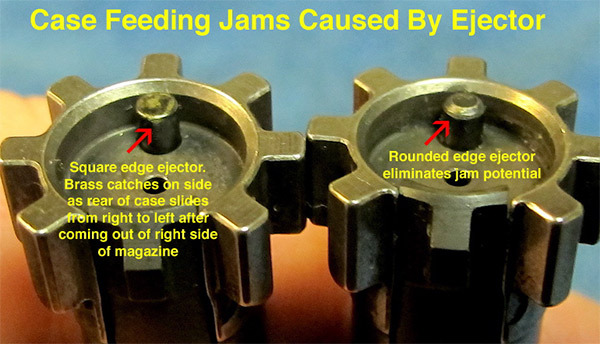 This fix is easy to do and permanently resolves this potential feeding jam issue. There are no downsides to this modification if done right and I would recommend this modification for the ejectors in all larger bolt-face AR-15 bolts. This gunsmithing tip provided by Robert Whitley of AR-X Enterprises LLC, 199 North Broad Street, Doylestown, PA 18901. Phone: (215) 348-8789. Website: 6mmAR.com. Share the post "AR Ejector Mod For Improved Reliability with Larger Cartridges"
If you have a digital camera or scanner, you can measure your shot groups easily with the FREE On-Target software (read our On-Target Software Review). However, not many people want to lug a laptop to the range just to measure their groups. Most folks measure their groups at the range with a small ruler, or a set of calipers. That works pretty well, but there is a much more precise method. Neil Jones makes a specialized group-measuring tool that fits a special optical viewing lens and shot-size template to your precision calipers. There are two main parts to the tool. The first part, attached to the fixed caliper jaw, is a block holding a spring-loaded plunger with a sharp point (used to anchor the tool). The second part is clamped to the sliding jaw assembly. This viewing unit has a magnifying lens plus a plexiglass plate with scribed centerline and circular reticles for various calibers (.224, 6mm, 30 cal). This device works with both conventional and digital calipers. You’ll find the Jones Target Measure Tool used by the official target measurers at many big benchrest matches. Jones claims that his tool “will speed up the measuring process and be more accurate than other methods.” The Neil Jones Target Measure Tool costs $80.00, which includes magnifier, but not calipers. It comes in two versions, one for dial calipers, the other for digital calipers. Neil Jones also sells his tool complete with dial calipers for $120.00, or with digital calipers for $150.00. It is probably cheaper to source your own calipers. To order the Jones Tool, visit Neiljones.com, email njones@mdvl.net, or phone (814) 763-2769. 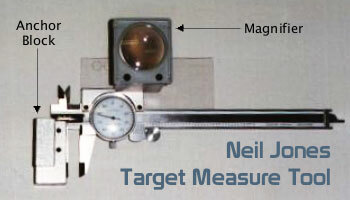 CLICK HERE for Detailed Review of Neil Jones Target Measure Tool. 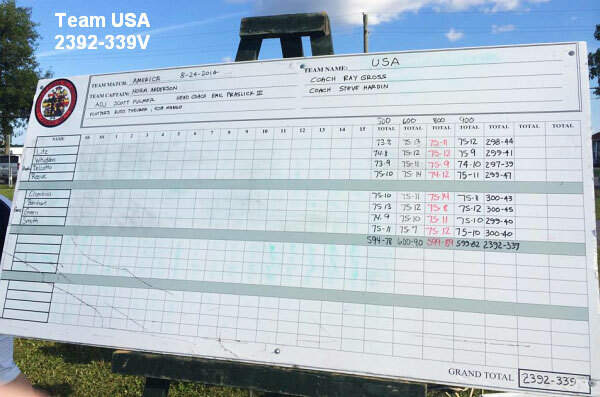 Share the post "Measure Groups Precisely with Neil Jones Tool"